Those three boarded together in Death Valley. Juan Flynn also boarded with them. Perhaps Flynn isn't in the pic because he is the phographer? 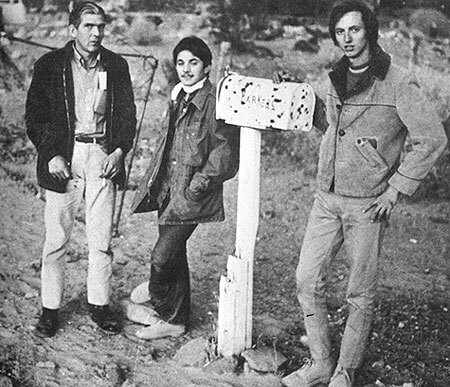 Those four stuck it out a while in Death Valley after Charlie and Co arrived a few weeks after they had killed TLB. After the 2nd armed night time attack by Charlie while they slept Crockett demanded a pow wow between he and Charlie. Things cooled a bit but the three in the pic finally fled in fear for their lives. They fled to the Shoshone caves. Does Poston still play music and gig around Southern California? Are there more pictures of Paul Watkins? His book was really good and I never understood why his story was not turned into a movie. I recall meeting two of the above characters at my father's house on Farndon Ave. in Los Altos, during the early 1980's. One was Paul Crockett, who became a buddy of my retired Lockheed programmer father. The other was a guitar playing singer. They were guests invited by my stepmother...who also has hinted to me since she could easily have me killed. All she has to do is ask a friend. Hmm. . . .